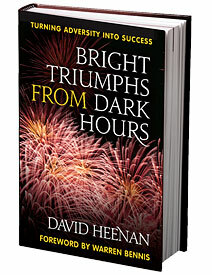 "David Heenan’s fascinating stories of overcoming adversity make Bright Triumphs both a timely and inspiring read." David Heenan is a trustee of the Estate of James Campbell, one of the nation’s largest landowners and a visiting professor at Georgetown University. Formerly, he served as chairman and CEO of Theo. H. Davies & Co., Ltd., the North American holding company for the Hong Kong-based Jardine Matheson. Earlier, he was the vice president for academic affairs at the University of Hawaii and, before that, dean of its business school. In addition, he has worked internationally for Chevron, Citigroup and Jardine Matheson. An active writer, Heenan’s articles have appeared in such diverse publications as the Harvard Business Review (seven times), the Sloan Management Review, The Wall Street Journal, The New York Times, and The Christian Science Monitor. He is the author or co-author of seven other books, including Flight Capital, Co-Leaders and Double Lives. Heenan holds the A.B. degree from the College of William and Mary, the M.B.A. from Columbia University and the Ph.D. from the University of Pennsylvania. He has served on the faculties of the Wharton School, Columbia Business School and the University of Hawai‘i. He also serves or has served on the boards of eight publicly traded companies. Heenan lives in Honolulu, Hawaii. He is available for speaking engagements and may be contacted at .